What is the greatest prime factor of 399? To see this week’s answer choices and to submit your pick, visit our Challenge Problem page. When it comes to quantitative comparison questions, zero is a pretty important number, because it’s a weird number. It reacts differently from other numbers when placed in some of the situations. And zero isn’t the only weirdo out there. Most of us equate “number” with “positive integer”, and for good reason. Most of the numbers we think about and use in daily life are positive integers. Most of our math rules were learned, at least at first, with positive integers. The GRE knows this, and takes advantage of our assumption. That’s why it’s important to remember all the “other” numbers out there. In particular, when testing numbers to determine the possible values of a variable, there are a few categories of numbers you want to keep in mind. So we’ve got positive and negative integers (the bigger the absolute value, the better), positive and negative one, positive and negative fractions, and zero. Don’t forget, zero is an integer too! There are other categories of numbers to think about, particularly if they are mentioned in the problem: odd versus even, prime versus non-prime, etc. But the seven groups listed above account for most of the different ways that numbers behave when you “do math” to them. Because of that fact, picking numbers from different categories can be a fast way to understand the limits of a problem. To illustrate my point, let’s think about the value of x raised to the power of y. What happens to the value of that expression as y gets bigger? Let’s simplify our lives even further by stipulating that y is a positive integer. What first comes to mind is the idea that as we increase the value of the exponent, we increase the value of the expression. Well, if x is a positive integer, that’s true: the expression gets exponentially bigger as y increases. Unless x is the positive integer 1, in which case the expression stays the same size, regardless of the value of y. The same is true if x is equal to 0. If x is a positive proper fraction, the expression gets smaller as the value of y increases. The outer figure above is a rectangle with four rounded corners of radius equal to 2. The inner figure is a circle. Submit your pick over on our Challenge Problem page. GRE Math Refresher or Refreshing Math? During class 2 of our program, we teach a lesson entitled Math Refresher. I thought it would be fun to share one of the problems with you and talk through two things: (1) the actual algebra (real math) we would need to solve the problem, and (2) the standardized testing skills that allow us to solve the problem much more easily. 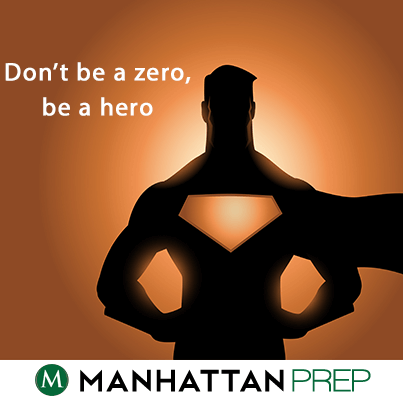 First, try this problem (© Manhattan Prep). Note: there are no multiple choice answers: you have to come up with a number on your own! How did you do it? Did you write some equations? Try out some numbers? Find some other cool shortcut? On this one, the best approach is a very neat shortcut that I’m going to show you “ but only after I show you the actual algebra. It’s important to know how to do the algebra, just in case you don’t know or can’t find any good shortcuts.